The tiny Himalayan kingdom of Bhutan, aghast at what it calls the world’s “suicidal path”, has called on heads of state and leading economists to come to the capital Thimphu for a global summit to reform the international financial system and the way countries measure progress. “We need to rethink our entire growth-based economy so that we can thrive more effectively on our own resources in harmony with nature. We do not need to accept as inevitable a world of impending climate chaos and financial collapse,” prime minister Jigmi Thinley will tell the UN in New York on Monday. Bhutan ? sandwiched between China and India with a population about the size of Birmingham ? has avoided social and economic chaos, he says, because it is not hooked to the materialist bandwagon and because it measures progress by the level of happiness among its citizens and not by gross domestic production. It proposes that purely economic measures of growth which count resource depletion and pollution as gains lead to ecological destruction and over-consumption. “Economic growth is mistakenly seen as synonymous with wellbeing. The faster we cut down forests and haul in fish stocks to extinction, the more GDP grows. 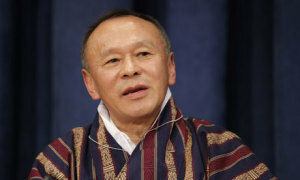 Even crime, war, sickness, and natural disasters make GDP grow, simply because these ills cause money to be spent”, Thinley will say in Bhutan’s submission to the UN ahead of the Rio +20 earth summit in June. “The [global] economic system is in rapid meltdown. It is based on the premise of limitless growth on a finite planet. It has produced ever-widening inequalities with 20% of the world now consuming 86% of its goods, while the poorest 20% consume 1% or less and emit 2% of the worlds greenhouse gases.”. Bhutan’s leaders argue that institutions like the World Bank and IMF, set up in 1944 to govern commercial and financial relations between the world’s major states, are now perilously outdated and must be reformed to avoid catastrophe. In their place, they say, must come new systems of fair trade, rewards for good behaviour, prompt responses by countries to resource depletion and new ways to measure social, economic and ecological progress. “The world is in need of an international consensus for the creation of a new economic paradigm with well-being indicators, new national accounting systems that count natural and social capital, and incentives for sustainable production”, Bhutan says. The clarion call for a new system of financial governance is supported by the UN and 68 countries so far. Last year the UN adopted Bhutan’s call for a “holistic approach” to development, aimed at promoting wellbeing and happiness. ed a gross national happiness index to guide all public policy. Its constitution now ensures that at least 60% of the country remains under forest cover in perpetuity and its aim is to be 100% organic in its agricultural production. Life expectancy has doubled in two generations, 99% of primary age children are in school, and the country has vowed to always be a carbon sink. However, it remains one of the “poorest” nations on earth, with 25% of its people living on less than $1.25 a day, and 70% without electricity. Until 1974, no tourists were allowed into the Buddhist nation. “[Our] measures of progress and GNH index clearly show that producing and consuming more stuff does not make people happier. On the contrary when they overwork and go into debt to buy ever more goods and pay the bills, they get more stressed. Working, producing and consuming less is not only good for nature but gives us more time to enjoy each others”, says Thinley. “Instead of progress [the world] has perilously accelerated ecosystem decline. Humanity is now using up natural resources at a 35% faster rate than nature can regenerate. This ecological destruction is not separate from global economic realities that are dividing rich from poor”, Bhutan will say in its submission. The New York meeting will lay the groundwork for countries to adopt new “sustainable development” goals at the Rio +20 meeting, the follow-up to the historic 1992 “Earth summit” which saw the introduction of global treaties to address climate change and biodiversity loss.